Hi, I run Z1 engine in the RZR 1000 using ViPec AC 11 with this swap. But my temperature warning is flashing too soon , around 190. But can't figure out how to rise the warning, if even possible in the ECU programing. Any help will be really appreciated . It will be a function of the Dash we just send the info through to the dash. One thing could be the ECU is seeing temps that are too high which would head through to the Dash. Thanks, but if I run stock ECU the temp warning is not flashing in the speedo on such low temp like does with the Vi Pec. Not sure why would ViPec seeing higher temp than stock ECU...not 100 % sure, but I think temp warning flash should start when temp is close to 210.
is the temp sensor parameters setup correctly in the software in the pcl file. Not sure if is right way, but I set it like that. 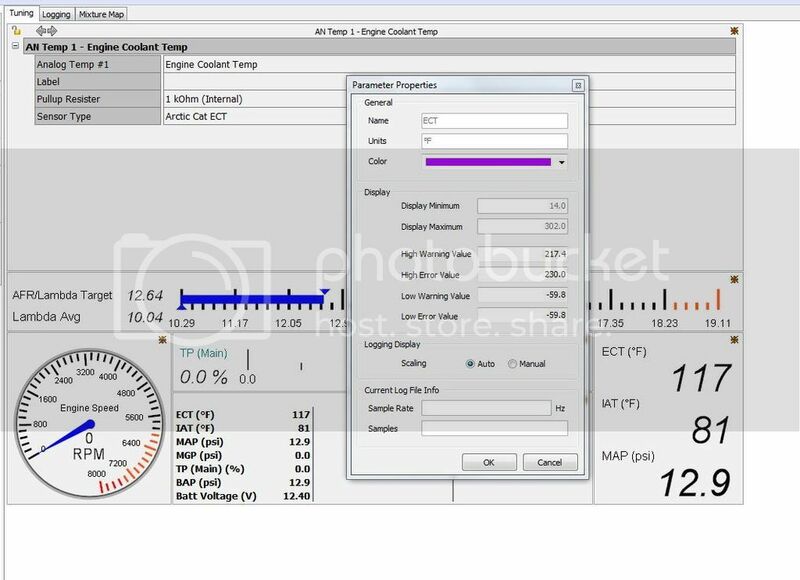 In the screen shot you have there you can see the ECT reading is at 117F is this correct or do you suspect this is out? If this is out then the Artic Cat temp cal is likely incorrect for the sensor. This screen shot I took is not with the engine running, just stay there after engine was turn off. We need to check the ECU temp is reading correctly. If you check this figure with the ECU live and engine at varying temps. It is likely the ECU is reading the temp higher than it actually is. Honestly, that I think is the problem, ViPec ECU sees higher temperature reading than actually is. I can compare to the ECU reading to the my temp gauge, but without riding I can't get to 190 and temp flashing. Plus need the help with AFR gauge hook up for the logging. I use Innovate MTX L, but analog output from them is set for AFR. In the ViPec manual look like the calibration could be done in the AFR, but in the drop menu for calibration AFR is not as option, just Lambda . The air fuel ratio corresponding to 0V is 9.0:1 while the air fuel ratio corresponding to 5V is 19.0:1. This information should be entered in the following way. Â· Input Value A - 0.00 V This is the sensor voltage at the first point. Â· Input Value B - 5.00 V This is the sensor voltage at the second point.